Kevin Hugh Lowe (born April 15, 1959) is a Canadian professional ice hockey executive, former coach and former player. 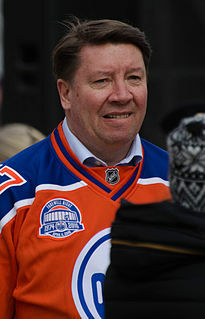 Lowe is the vice-chairman of Oilers Entertainment Group, having formerly served successively as head coach and then general manager of the Edmonton Oilers. As a defenceman, he played for the Edmonton Oilers and the New York Rangers. 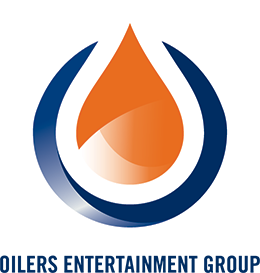 Oilers Entertainment Group (OEG) is a company based out of Edmonton, Alberta, that operates Katz Group of Companies' sports and entertainment offerings. The flagship property and namesake is the Edmonton Oilers of the National Hockey League. OEG also operates Rogers Place, the new home of the Oilers in downtown Edmonton. OEG is owned by Daryl Katz. There have been two junior ice hockey franchises known as the Quebec Remparts that played in the Quebec Major Junior Hockey League (QMJHL). The first edition played from 1969 to 1985; the current franchise has played since 1997. 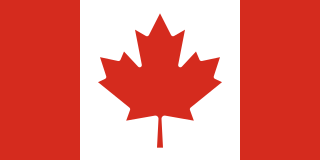 Both franchises were based out of Quebec City, Quebec, Canada. The current team plays at Videotron Centre. The team is named after the Ramparts of Quebec City. The Quebec Major Junior Hockey League is one of the three major junior ice hockey leagues which constitute the Canadian Hockey League. The league comprises teams across the provinces of Quebec, Nova Scotia, New Brunswick and Prince Edward Island. Since the departure of the Lewiston Maineiacs from Lewiston, Maine, the QMJHL is the only one of the three member leagues of the CHL that does not currently have teams located in the United States. The current president of the QMJHL is Gilles Courteau. The NHL Entry Draft is an annual meeting in which every franchise of the National Hockey League (NHL) systematically select the rights to available ice hockey players who meet draft eligibility requirements. The NHL Entry Draft is held once every year, generally within two to three months after the conclusion of the previous season. During the draft, teams take turns selecting amateur players from junior or collegiate leagues and professional players from European leagues. 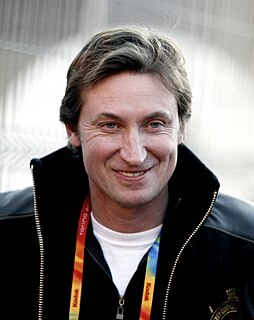 Wayne Douglas Gretzky is a Canadian former professional ice hockey player and former head coach. He played 20 seasons in the National Hockey League (NHL) for four teams from 1979 to 1999. Nicknamed "The Great One", he has been called "the greatest hockey player ever" by many sportswriters, players, and the league itself. Gretzky is the leading scorer in NHL history, with more goals and assists than any other player. He garnered more assists than any other player scored total points, and is the only NHL player to total over 200 points in one season – a feat he accomplished four times. In addition, Gretzky tallied over 100 points in 16 professional seasons, 14 of them consecutive. At the time of his retirement in 1999 and persisting through 2017, he holds 61 NHL records: 40 regular season records, 15 playoff records, and six All-Star records. Glenn Chris Anderson is a Canadian retired professional ice hockey player who played 16 seasons in the National Hockey League (NHL) for the Edmonton Oilers, Toronto Maple Leafs, New York Rangers, and St. Louis Blues. Anderson was known to have a knack for stepping up in big games, which garnered him the reputation of a "money" player. His five playoff overtime goals rank third in NHL history, while his 17 playoff game-winning goals put him fifth all-time. During the playoffs, Anderson accumulated 93 goals, 121 assists, and 214 points, the fourth, ninth, and fourth most in NHL history. Anderson is also first all-time in regular season game winning goals in Oilers history with 72. Jeffrey Scott Beukeboom is a Canadian professional ice hockey coach and former player in the National Hockey League (NHL). He played as a defenceman for the Edmonton Oilers and New York Rangers. Ronald Albert Low is a Canadian former ice hockey goaltender and coach. He grew up in Foxwarren, Manitoba. Glen Cameron "Slats" Sather is a Canadian ice hockey player, coach and executive. He is the current Senior Advisor and Alternate Governer of the New York Rangers of the National Hockey League (NHL),after stepping down from the position of President a post he has held since 2000. He was also general manager until stepping down on July 1, 2015. He is known for coaching the Edmonton Oilers to four Stanley Cup victories during the 1980s. He played a key role in attracting the talented players, including Wayne Gretzky, who helped make the Oilers a hockey dynasty at that time. Gretzky, who became "the most dominant player in the history of the game," credits Sather, along with Walter Gretzky, his father, as his most important mentors. Outside the NHL, Sather was instrumental in building Canadian national teams for the 1984 Canada Cup, the 1994 Ice Hockey World Championship and 1996 World Cup of Hockey (Finalists). Prior to coaching, Sather was a professional ice hockey left winger in the WHA and NHL, playing for several teams over a 10-year period. Sather was born in High River, Alberta but grew up in Wainwright, Alberta. Sather resides in Rye, New York during the season and Palm Springs, California in the off-season, but also has a home in Banff, Alberta. He was inducted into the Hockey Hall of Fame in 1997. Jari Pekka Kurri is a retired Finnish professional ice hockey right winger and a five-time Stanley Cup champion. He was inducted into the Hockey Hall of Fame in 2001. In 2017 Kurri was named one of the '100 Greatest NHL Players' in history. He is the general manager of Jokerit. Craig MacTavish is a Canadian professional ice hockey executive and former player. 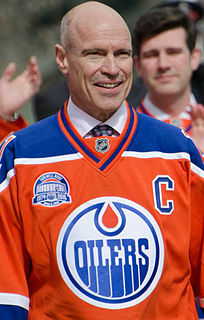 He is the current Vice President of Hockey Operations for the Edmonton Oilers, and has also served as the team's head coach and general manager. He played centre for 17 seasons in the National Hockey League with the Boston Bruins, Edmonton Oilers, New York Rangers, Philadelphia Flyers and St. Louis Blues, winning the Stanley Cup four times. MacTavish later coached the Oilers from 2000 to 2009 and also served as assistant coach with the Rangers and Oilers. The 1990 Stanley Cup Finals was the championship series of the National Hockey League's (NHL) 1989–90 season, and the culmination of the 1990 Stanley Cup playoffs. It was contested by the Edmonton Oilers and the Boston Bruins; the Oilers won, four games to one. For the Oilers, it was their fifth Cup win in seven years, and the only one since they traded Wayne Gretzky to the Los Angeles Kings in 1988. This would be the last of eight consecutive Finals contested by a team from Alberta. Neil Smith is a Canadian ice hockey broadcaster, and previously the general manager of both the New York Rangers from 1989–2000 and (briefly) the New York Islanders in 2006. He was also the owner and head coach of the Johnstown Chiefs of the ECHL. He last was the president, general manager, and governor of the Greenville Road Warriors of the ECHL. He now is an on-air analyst for the NHL Network. Reijo Ruotsalainen is a Finnish retired ice hockey defenceman. He was twice named Finland's top defenceman, and won two Stanley Cups with the Edmonton Oilers, in 1987 and 1990. Bernard Irvine Nicholls is a Canadian former professional ice hockey centre. His junior career was spent with the Kingston Canadians, where he established himself as a dynamic scorer and a multi-faceted talent. He was selected by the Los Angeles Kings in the fourth round of the 1980 NHL Entry Draft, 73rd overall. Over his 17-year playing career, Nicholls would play 1127 games for the Los Angeles Kings, New York Rangers, Edmonton Oilers, New Jersey Devils, Chicago Blackhawks and San Jose Sharks, scoring 1209 points. He is one of only 8 players in NHL history to score 70 goals in one season, and one of 5 to score 150 points. Nicholls was born in Haliburton, Ontario, but grew up in West Guilford, Ontario. The 1988 Stanley Cup Finals was the championship series of the National Hockey League's (NHL) 1987–88 season, and the culmination of the 1988 Stanley Cup playoffs. It was contested between the Edmonton Oilers and Boston Bruins. The Oilers would win the series 4–0 in four games. This would be the sixth of eight consecutive Finals contested by a team from Alberta, and the last of five consecutive Finals to end with the Cup presentation on Alberta ice. The series is remembered for the power failure that occurred during game four at Boston Garden, which caused that contest to be suspended. The league decided to replay game four at Northlands Coliseum in Edmonton, at the original site, date and time that was originally scheduled for game five. The 1985 Stanley Cup Finals was the championship series of the National Hockey League's (NHL) 1984–85 season, and the culmination of the 1985 Stanley Cup playoffs. It was contested between the defending champion Edmonton Oilers and the Philadelphia Flyers. The Oilers would win the best-of-seven series, four games to one, to win their second Stanley Cup. It was also the sixth straight Finals contested between teams that joined the NHL in 1967 or later. As of 2018, this is also the last time that a team, defending champion or runner-up, would appear in the Finals for the third straight season. This would be the third of eight consecutive Finals contested by a team from Alberta, and the second of five consecutive Finals to end with the Cup presentation on Alberta ice. The 1983–84 Edmonton Oilers season was the Oilers' fifth season in the NHL. After an outstanding regular season, the Oilers won their first Stanley Cup. The 1984–85 Edmonton Oilers season was the Oilers' sixth season in the NHL, and they were coming off a Stanley Cup championship in 1983–84. Edmonton would win their fourth-straight Smythe Division title, and repeat as Stanley Cup champions. On June 5, 2017, this team was voted by fans as the greatest NHL team ever, as part of the NHL's centennial celebrations. The 1991–92 Edmonton Oilers season was the Oilers' 13th season in the National Hockey League (NHL), and they were coming off a third-round playoff appearance in 1990–91, losing to the Minnesota North Stars in the Campbell Conference finals. Founded in 1971, the Edmonton Oilers are a professional ice hockey National Hockey League (NHL) team based in Edmonton, Alberta. The team played its first season in 1972–73 as one of 12 founding franchises of the major professional World Hockey Association (WHA). They were originally supposed to be one of two WHA teams in Alberta. However, when the Broncos folded before the WHA's first season began, the Oilers were renamed the Alberta Oilers. They returned to using the Edmonton Oilers name for the 1973–74 season, and have been called that ever since. The Oilers subsequently joined the NHL in 1979; one of four franchises introduced through the NHL merger with the WHA. ↑ Cox, Damien (10 October 2007). "It's all about the dough? Not so in this Burke-Lowe feud". ESPN.com. ESPN. Retrieved 16 December 2017. ↑ "Oilers GM Lowe fires back at Ducks' Burke". CBC.ca. CBC News. 5 July 2008. Retrieved 16 December 2017. ↑ "Bettman tries to put an end to Burke/Lowe feud". Archived from the original on October 19, 2012. Retrieved December 7, 2017. ↑ "Bettman Orders Burke, Lowe To "Cease and Desist" Bickering". sportsbusinessdaily.com. 8 July 2008. Retrieved 16 December 2017. ↑ Matheson, Jim (26 May 1988). 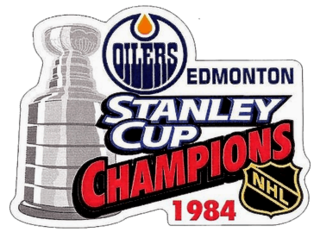 "Edmonton Oilers history: Team sweeps Boston Bruins to win its fourth Stanley Cup, May 26, 1988" . Retrieved 16 December 2017. ↑ "KEEGAN LOWE". eliteprospects.com. Retrieved 21 December 2017. ↑ Staples, David; June 12, Edmonton Journal Updated:; 2014 (2014-06-13). "Kevin Lowe the player: "If I don't practise hard, I could lose my job." | Edmonton Journal" . Retrieved 2019-04-18. ↑ Tait, Cam (January 30, 2017). "Office to the Track: 140 kms [sic] an hour for Melissa Lowe". NHL.com. Edmonton Oilers. Retrieved 21 December 2017.